EXPANDING THE PRO14 into the United States has been put on the long finger and strengthening the relationship with South Africa rugby is the primary concern, according to the chief executive of the competition. 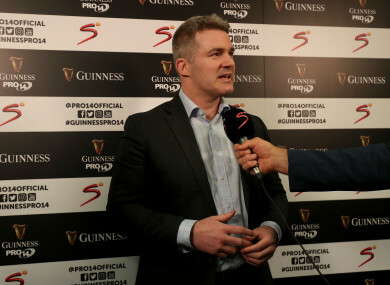 Martin Anayi, chief executive of the Pro14, said that the link with South Africa is to be developed in the coming years. Anayi and other Pro14 officials held a series of meetings in South Africa last week, which included meeting representatives of the Cheetahs, Southern Kings, the SARU and South Africa director of rugby Rassie Erasmus, the former Munster coach. Erasmus and SARU president Jurie Roux have been appointed to the board of the Pro14 following discussions in Bloemfontein last week. The strengthening of the link between the former Celtic League and South Africa means that proposed expansion into the United States is not on the agenda at present. He was speaking following a meeting with the SARU, the Cheetahs and Southern Kings at the Toyota Stadium on Friday morning in Bloemfontein. The officials, along with Erasmus, attended the Cheetahs game against Munster at the venue that evening and Anayi said that the link-up with South Africa had worked well for all parties. “We have had those discussions and I know it has gone really well. You have got Cheetahs in the play-off spot. Speaking to Franco Smith, who is coming back from Springboks to be the head coach with the Cheetahs, and he is incredibly excited. “He coached in the Pro12 with Treviso and he brings a new vigour to it. Anayi said that having Erasmus fully behind the link-up is also key, especially given his time in Munster. He is saying that the gap between Pro14 and Test rugby is the right gap and with Super Rugby it is slightly different. “He sees the quality of the rugby but also the tactical game has been something the Springboks can benefit from. It was great to hear that,” added Anayi. The Pro14 chief executive said that the Cheetahs and the Southern Kings are tied into the competition for at least the next two seasons. “Even longer term than that. There is an option then in the future to look at more. He said that overall they are happy with how the first season has gone, not least as the decision to expand happening quite quickly last summer. The nightmare 55-hour journey which Cardiff Blues endured last week on their way to play the Southern Kings served to highlight some of the logistical problems involved, but Anayi said these can be overcome with planning. Email “Pro14 expansion to US put on long finger as South Africa link strengthened”. Feedback on “Pro14 expansion to US put on long finger as South Africa link strengthened”.